Digital postcards from the future: the power of images to describe the upcoming architecture and urban scenarios. 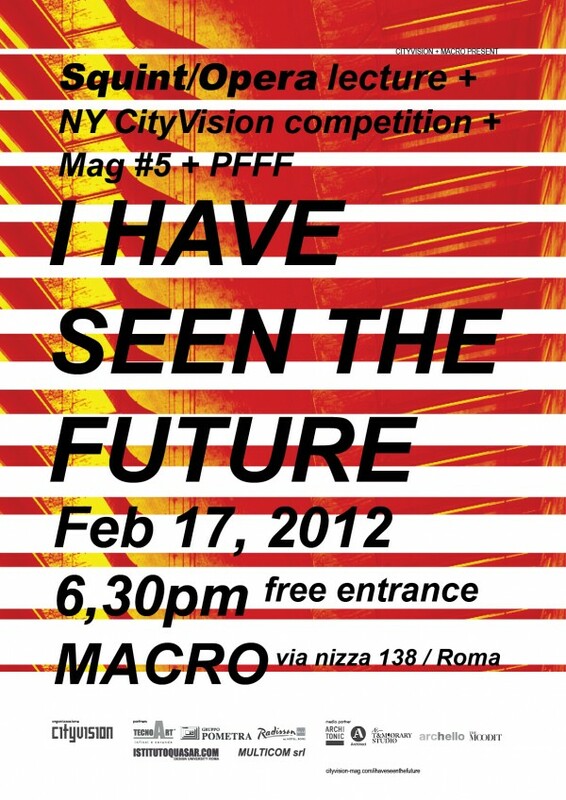 I HAVE SEEN THE FUTURE was that: an event by the Roman group of CityVision held on February 17, 2012 at MACRO, Museum of Contemporary Art in Rome. In an completely filled auditorium, the evening was opened with great emphasis by Francesco Lipari, curator of the event along with Vanessa Todaro, Marco Arciero, Paolo Emilio Bellisario and Maria Azzurra Rossi. After presenting the fifth issue of CityVision magazine, new upcoming events and the portal pastshock.tumblr.com, Francesco Lipari has announced New York CityVision: the new international architectural competition organized by CityVision which this year will investigate the future of the Big Apple. The jury panel will be composed by Joshua Prince-Ramus (REX Architects), Eva Franch i Gilabert (Storefront for Art & Architecture), Roland Snooks (Kokkugia), Shohei Shigematsu (OMA ny), Alessandro Orsini (Architensions) and Mitchell Joachim (Terreform One). During the vent space for the eleven finalists and the three winners of PFFF, the competition organized by CityVision and FARM, about an inflatable architecture. The first prize went to Emmanuel Sitbon and Selma Feriani from Paris that, in addition to the prize, will see their project realized. Shortlisted and winners will be awarded during a special event on June. After that the scene was only for Jules Coke, founding director of SQUINT/OPERA, the well-known London based office focused on architectural communication and creative media. During the lecture, Jules Coke, for the first time in Rome, completely kept the eyes of all presents glued to the screen. Starting from “The Usborne Book of the Future”, a book published in 1979, passing through the saga of Back to the Future, Coke has highlighted the significant gap between the perception of the future within the contemporary houses and cities. In an attempt to explain the needs and motivations of his work Jules Coke has also shown as paradoxically the image processing of a visionary future can be used to criticize the present or as a digital communication can be used in the community to easily speak to non-professionals through sounds, diagrams, visual stimuli. The use of visual communication in the hands of SQUINT/OPERA becomes a story about urban spaces and scenarios that stimulates the imagination of the beholders not without their personal interpretation. As Coke said, the story starts from a diagram, and then become something more organic and fluid to involve the viewer in the development of the project.